David Russell is a professional storyboard artist and writer. Russell has created illustrations for such movies as X-Men Origins: Wolverine, An American Werewolf in Paris and Batman (1989). 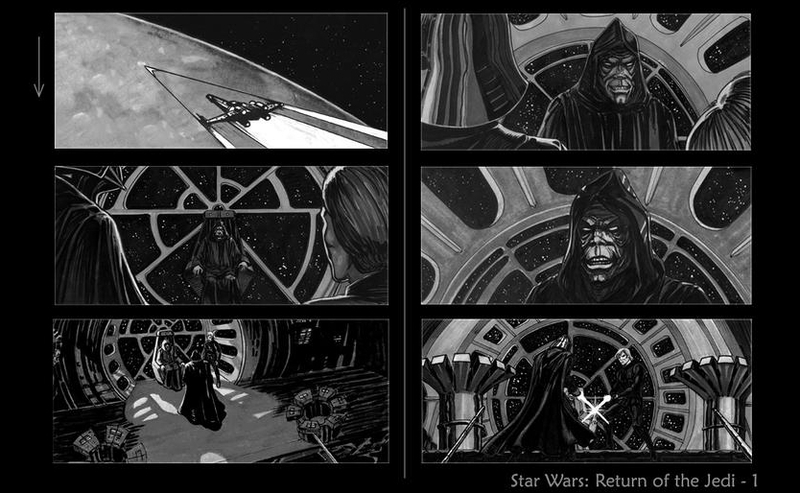 Below are storyboards for the final battle with the Emperor in Star Wars: Episode VI - Return of the Jedi. See more after the jump and click on the images to enlarge. Love. Except Emperor Palpatine's face, which looks weird. I was surprised about that too Alex. Usually the director just uses it a guide. It's Russell's style Joshua. His faces always have a unique look. I kind of like it myself. The Emperor looks like Rone Perlman. The Emperor looks like Ron Perlman.